Dove is expanding its deodorant portfolio with a product that it claims can improve underarm appearance, as it looks to further position itself as a beauty brand rather than a skincare range. Beauty Finish is the first product in the deodorant category to use the ingredient pearlescent mica, a mineral that is said to create a smooth finish on skin. It causes skin to appear 'enhanced' and 'flawless', supporting Dove's brand message to 'get your underarms gorgeous'. The Unilever-owned brand is targeting product-savvy consumers who respond regularly to innovations in the market. From April, the roll-out of Beauty Finish will be backed by a £3m campaign by Ogilvy, spanning TV, print and digital activity. 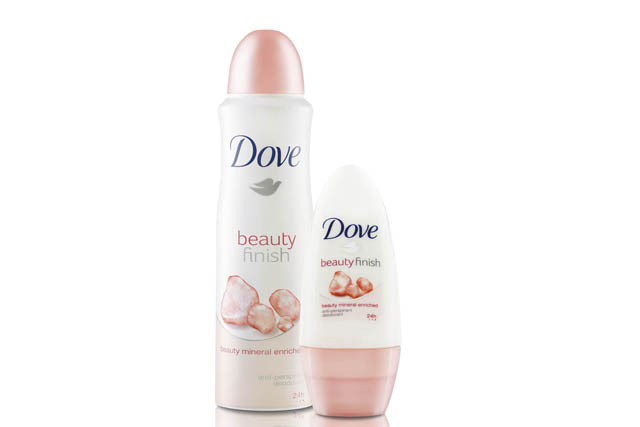 'Dove Beauty Finish will allow (the brand) to strengthen its appeal among younger and more beauty-conscious women,' said Dove brand manager Kim Santini. The campaign will seek to persuade women to 'trade up' from their current deodorant. Beauty Finish, which is available in both spray and roll-on formats, is presented in glittering pink-and-white packaging to highlight the use of 'beauty minerals'. The brand's owner, Unilever, is pushing Dove further into the beauty category. Earlier this month, it unveiled two lipcare products, Dove Caring Beauty Lip Balm and Dove Supreme Shimmer Lip Balm, to tie in with existing Dove body-lotion variants. In addition, Unilever has overhauled Dove's shower-product range by updating its packaging, adding several variants to the line and introducing its patented 'NutriumMoisture' technology, which it claims nourishes and moisturises the skin. The repackaged range will be supported by a £1.2m campaign, also due to break in April. Dove rebranded its haircare range last year, renaming it Dove Damage Therapy and focusing on products for damaged hair. The supporting £3.6m campaign featured light-hearted TV ads created by Ogilvy. In January, Unilever hired EHS 4D to handle its global digital activity across the Dove deodorant portfolio. This involves shaping the brand's strategy via websites, apps, display ads and social media activity. Dove launched its 'Campaign for real beauty' in 2004, introducing 'real women', rather than very slim, airbrushed models, to its marketing imagery in an attempt to challenge perceptions of beauty in advertising. As a former account leader on Nivea, I have my doubts about whether this will work. The deodorant category is about confidence: women will not see their underarms as a thing of beauty - they care about not having stains or sweat patches. In addition, the active ingredients, such as omega-6, highlighted in Dove's last deodorant campaign, were not properly explained. I personally associate omega-6 with brain food, not underarms.